I might live only three blocks away from it for the last 12 years, yet I never did go to the old Joe Marty's or the new until this last week. I'm probably better off for waiting that long. After all, the old Joe Marty's struck me as mostly a sports bar with typical bar type food. Then it burned down and the spot lay vacant for a number of years. When new owners opened hoping to ride the wave of nostalgia, it seemed to do OK business. Then earlier this year Sampino's took it over and I am feeling pretty lucky to have it so close now. And, to be clear, the official new name is Sampino's Kitchen at Joe Marty's. For a little history, Joe Marty's was opened in 1938 by an ex-baseball player and his friend. At that time Edmunds Field occupied the site of today's Target. You can see what the area looked like thanks to a giant photograph adorning a wall. The above description (pre-fire) pretty much explains the decor today, just fresh and new because of the rebuild after the fire. We came in after seeing a movie at the Tower and because I knew Sampino'shad taken it over. Now when it comes to Sampino's, I'd only ever been once due to its location and its hours, but I knew its reputation. Their location at 16th and F has been known for its fine Italian delicatessen, house made cannoli and tiramisu, and their Friday night dinners. I was looking forward to trying the food now at Joe Marty's. It's no surprise that the menu is Italian focused now. Better yet, good Italian. We ordered two entrees and they came with a choice of salad or minestrone. No brainer here. You need to order the minestrone. 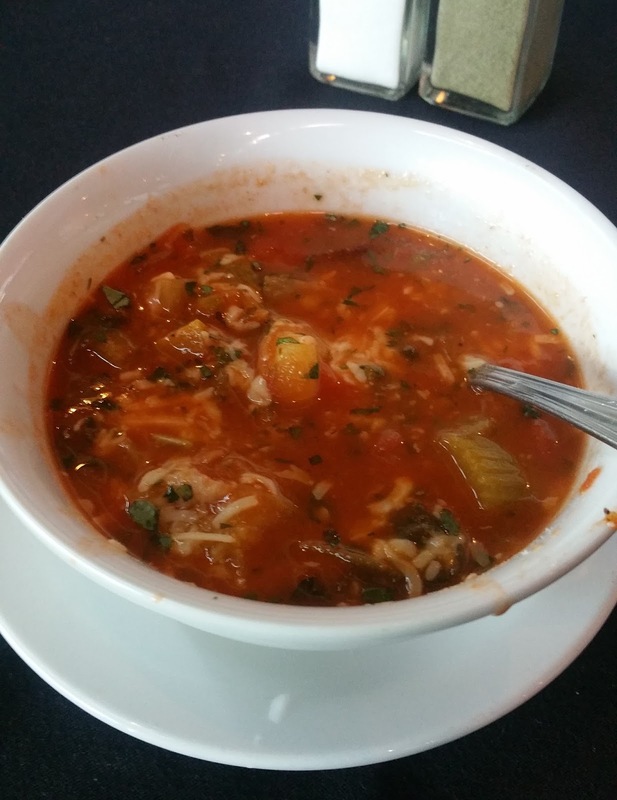 This soup was hearty and robust, full of flavor. The tomato base is tangy and rich. No watery soup here. Within is a load of vegetables. I didn't happen to notice if the minestrone can be ordered a la carte, but it would certainly be a great meal on its own. I'm pretty much a sucker for Chicken Piccata as soon as I see it offered on a menu. This was also packed with flavor with a thicker sauce than some. I loved it with just two reservations. The chicken arrived sliced and I would have preferred my chicken filet be left whole for me to cut. Mostly because chicken can be dry and I'd prefer it be left alone to help retain juices. The other is the lack of many capers. 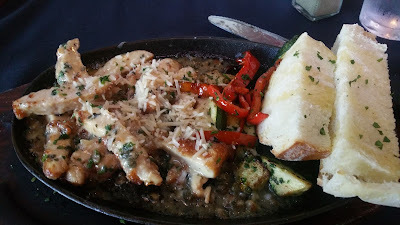 I love capers and so when I order piccata I like to have them. They were there, and I think they were blended into the sauce more than whole, but I need me some capers. My friend ordered the Eggplant Parmesan. 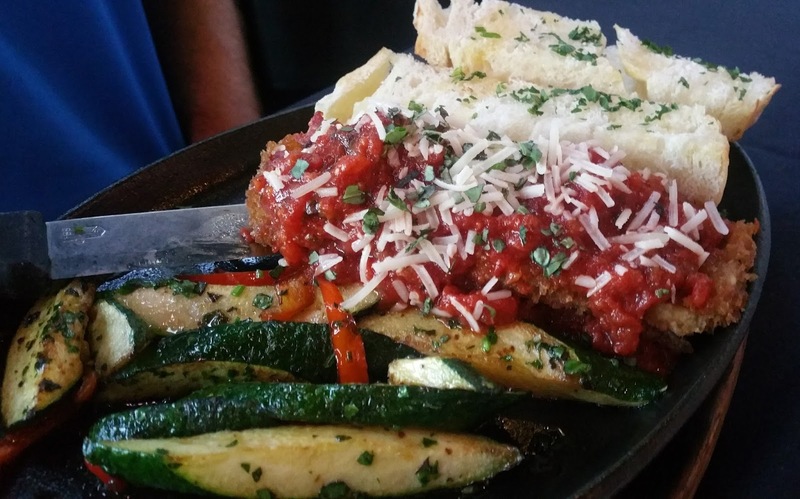 I've never been a chicken or eggplant parmesan fan and so I did not try it. It did look just as well prepared as the soup and my piccata though. As you can see, entrees came with garlic bread and a vegetable side. We didn't have dessert, but they do offer those famed cannoli and tiramisu I mentioned earlier. I mentioned to my friend how lucky I am to have such great food within walking distance from me now. With Masullo's, Selland's, South, Iron Steaks, and all the other nearby R Street/Southside additions, I'm in foodie heaven. Now to have Sampino's Joe Marty's added with its fine Italian, I'm stoked! I was told recently by a chef that used to work there that they do not really cook at the Joe Marty's kitchen. It is reheated items from Sampino's. While I can understand this to some extent, the amount the practice goes to is questionable. And is the stuff made at Sampino's made from scratch? I have to assume it is. But I found this news a bit troubling, especially just after having posted this positive review. I felt I needed to add this statement to the bottom of this post else I be called out as a fool for this review. Reno, like many cities, has seen its ups and downs. 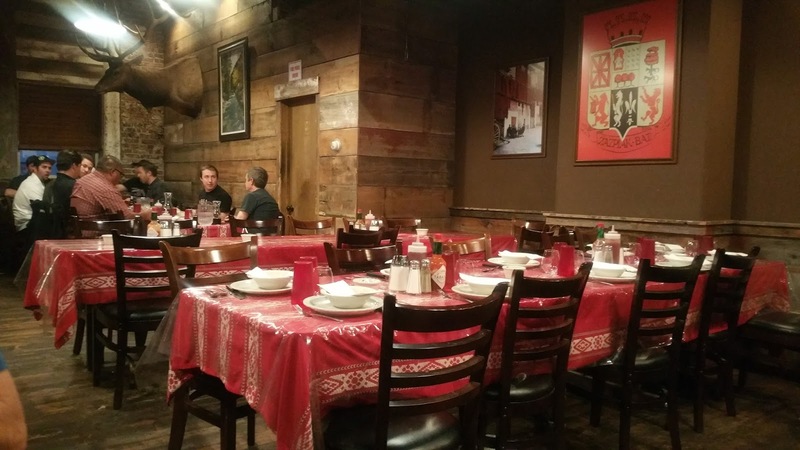 Finding a restaurant that can survive past a few years, yet alone a few decades, is hard to do in any city. 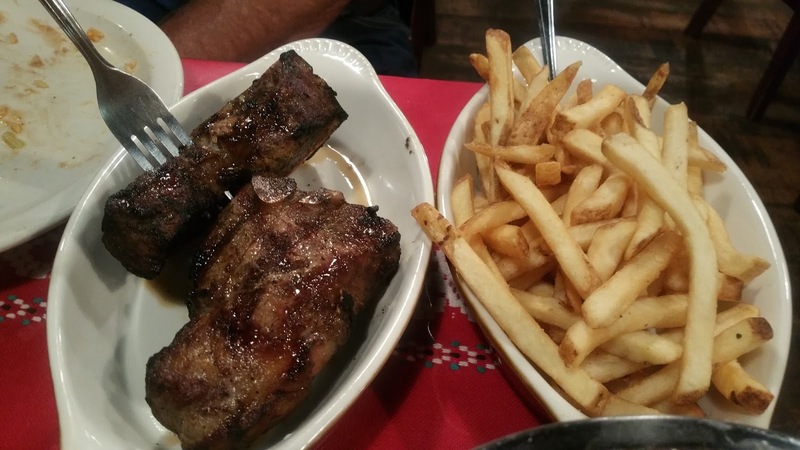 In the case of Reno's Louis' Basque Corner, it's a restaurant that has been a local favorite for decades and occasionally gets a tourist who's not interested in casino buffets or chains. Established in 1967, they are celebrating their 50th anniversary this year. I have yet to see any kind of announcement on their Facebook page or website, but I'm sure they'll be celebrating the accomplishment somehow this year. Louis' reminded me of Poor Red's up in Shingle Springs in that it features long communal tables and a set menu that includes soup, salad, appetizer, and dessert along with whatever entree you choose. They are also similar in that they are famous for a signature cocktail. Louis’ signature drink the Picon Punch, which is known in some corners as the "Basque cocktail" is based on a bitter orange spirit called Amer Picon made of bitter oranges, gentian and cinchona. It was invented by a Frenchman named Gaëtan Picon in 1837, and the drink evolved from a French aperitif and stomachic on its own into the punch through the hands of the Basques, especially in the earlier Boarding Houses and the Basque-American restaurants. I, of course, did not drink that (allergic), but we did enjoy the friendly service by the attentive staff and the very young owners! The original owners, Louis and Lorraine Erreguible, have apparently retired and sold the business to two young men, Chris Shanks and Brian Elcano. Turns out they were serving us and I only discovered this when reviewing their website tonight. You can tell this place is a local favorite as it was packed with people. We had ended a long drive up from Sac and arrived at 8:15. Large parties had just left and so most tables were now empty, but we were seated at a table that already had two other couples enjoying their meals. As to the food, there were hits and misses. 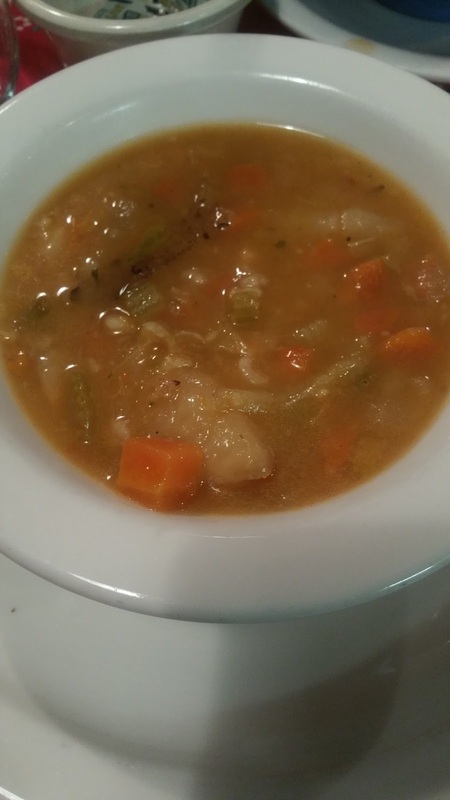 First we were served a vegetable, beef barley soup. This was a hit - hearty with ingredients, it could easily be a meal in itself. There was plenty of bread to sop it up as well. The salad was on par with Olive Garden or a crab feed. Not memorable. After that we were served the first course of mussels and rice along with the included Basque beans and our entrees. The beans were the hit with meaty flavor from the stock and pork. Turns out the owners shared the recipe back in 2005 and you can find it here. 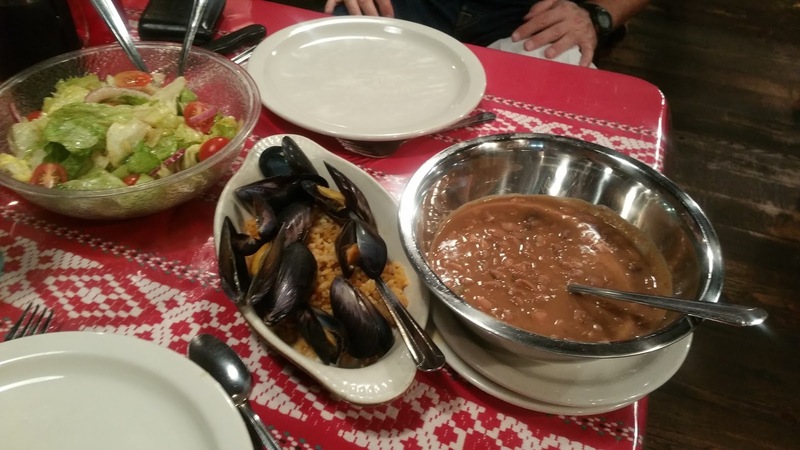 The mussels were the disappointment. Basically steamed and thrown on some rice with no seasoning. It would have been nice if they had been served with a nice wine and herb jus from the steaming. The entrees, though, were winners. Basque are eaters of offal and being that I host Have an Offal Day, I had to have the sweetbreads! I've always had sweetbreads as an appetizer, not as an entree, so I was a bit overwhelmed by such a generous serving! I had mine with peppers, onions, and garlic. It also includes mushrooms, but I'm not a fan and asked for those to be left out. The sweetbreads, though, were wonderfully tender and fried up crisp. As an FYI, they apparently also occasionally serve tripe and other offal dishes as specials, but the sweetbreads are on the regular menu. My friend ordered the lamb chops and was served two very thick chops, grilled to his preferred medium rare. Dessert is cheese and fruit plate or vanilla ice cream with chocolate sauce. Since we were stuffed, we passed on dessert. I recommend Louis' if you keep in mind the communal tables and family style dining are both hits and misses. You never know if you'll get friendly dinner companions at your table and the quality of the courses will be as mentioned above. But it's good value for your money, service is friendly and attentive, and a piece of Reno dining history that looks to continue on for another generation. 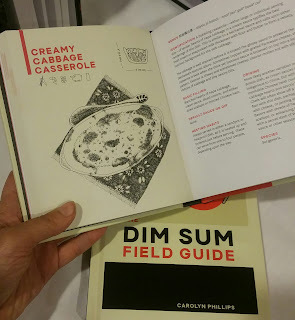 Need Some Dim Sum Help? 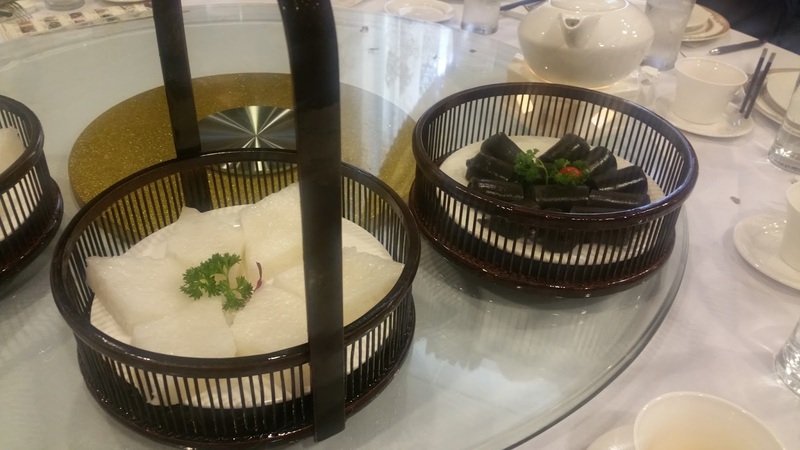 If you enjoy Chinese food then there's a very good chance you've gone to enjoy dim sum. Dim sum, a selection of bite size morsels of deliciousness, has been a part of Chinese cuisine for many centuries. 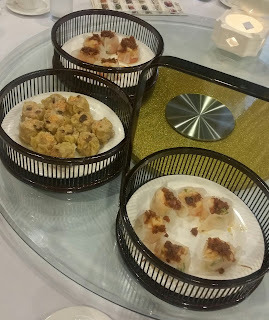 Dim sum are the small snacks served at teahouses, offering variety and the opportunity to eat as little or as much as one wants. Lately there has been a lot of discussion about cultural appropriation of foods. That (usually) white people are taking on and becoming experts of cuisines from countries that they have no connection to. 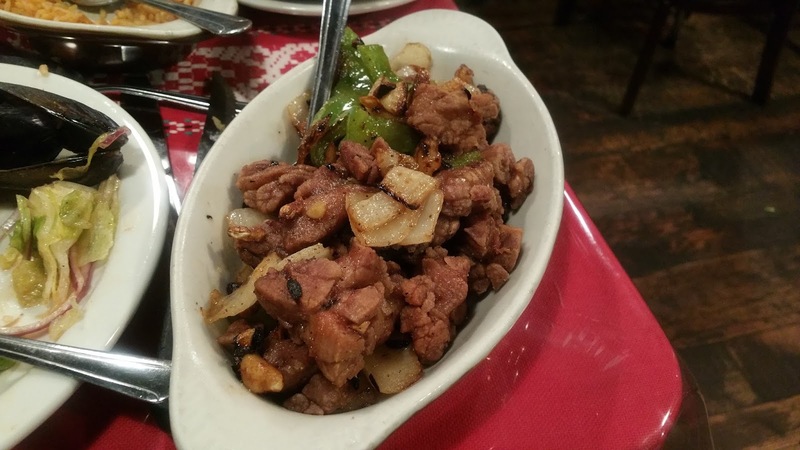 Prime examples are Rick Bayless and Mexican and Andy Ricker with Thai food. One person that might fall into that controversy would be Carolyn Phillips with Chinese food. Towards the end of our event Phillips makes a very profound comment - that the younger generations throughout China are moving toward Western diets and soon thousands years of culinary history will disappear if it isn’t documented. So really, is it so bad that some people have taken enough interest to thoroughly respect it, research it, and document it? 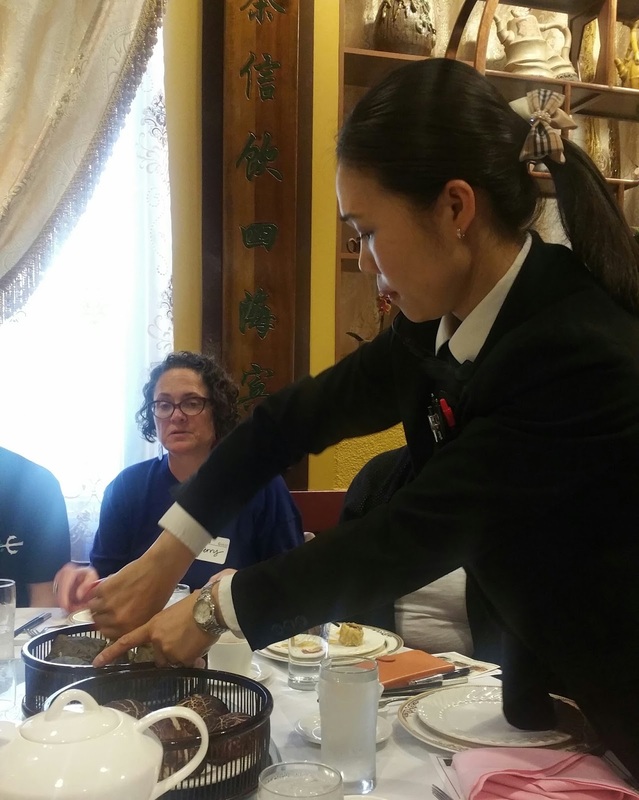 Carolyn Phillips has been researching Chinese cuisine for over 30 years. She’s written several books and has been nominated for a James Beard Award for All Under Heaven. She’s also known as Madame Huang, appropriate since her husband is author J.H. Huang. In her book, All Under Heaven, Phillips "divides China's food traditions into five major regions that share the same geography and climate, as well as similar basic ingredients, cooking styles, seasonings, and interaction among the cuisines. These were then further narrowed down into 35 unique food traditions." 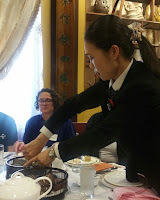 I was joining her and a roomful of other hungry diners at Peony Restaurant in Oakland’s Chinatown. 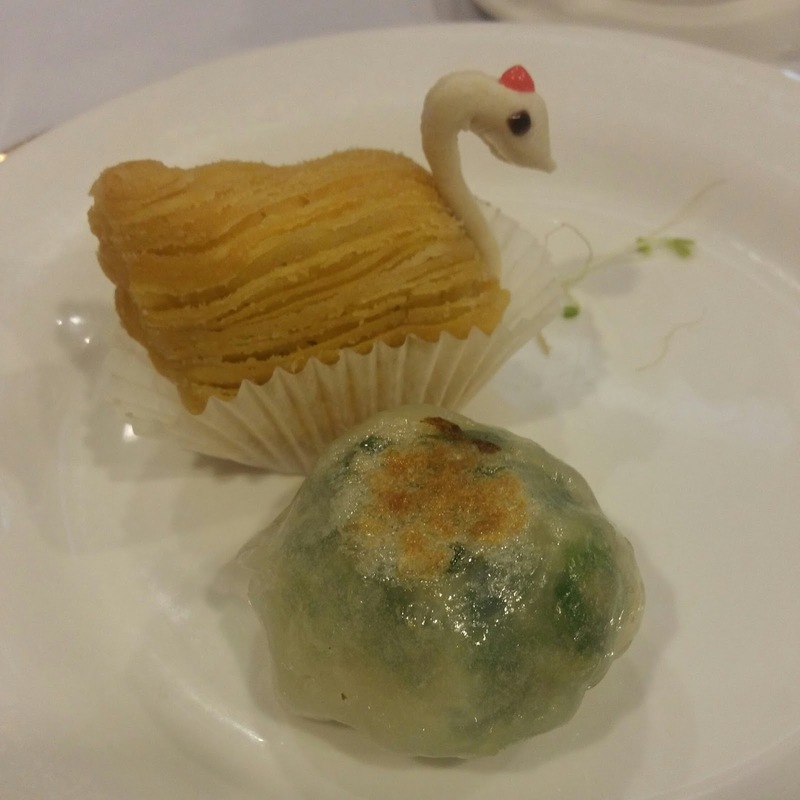 The event was a Dim Sum Sampling with a dose of education. Phillips has another small book, easy to take to dim sum with you, called The Dim Sum Field Guide. 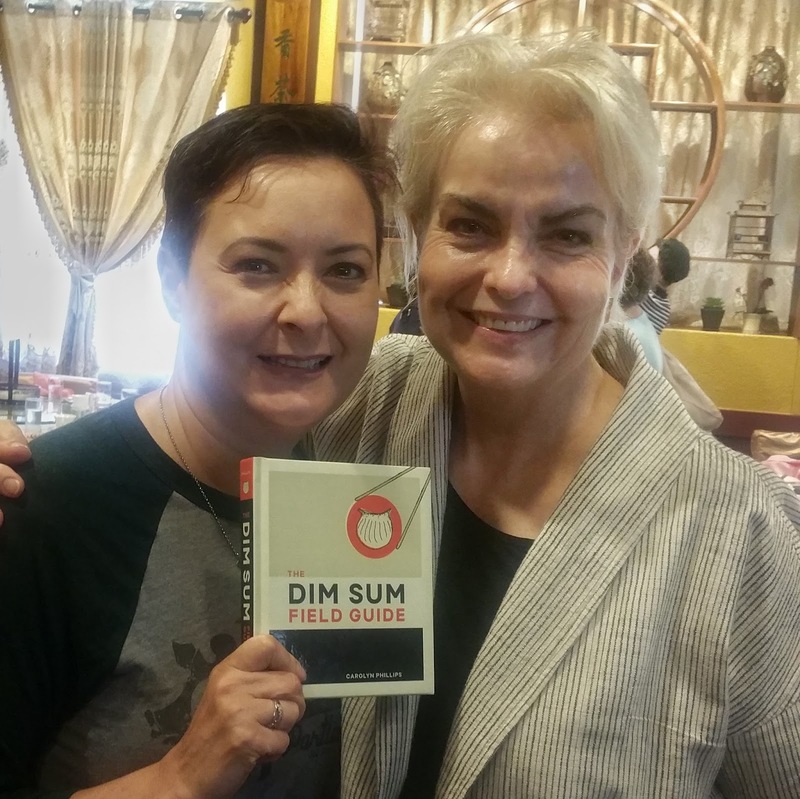 In it she goes over each piece of dim sum you might encounter and she gives you the area of origin, ingredients, and variations. She also tells you the proper way to eat it with which sauce. Each one is illustrated by Phillips’ own hand. Before we start, Phillips gives a short talk on dim sum etiquette. 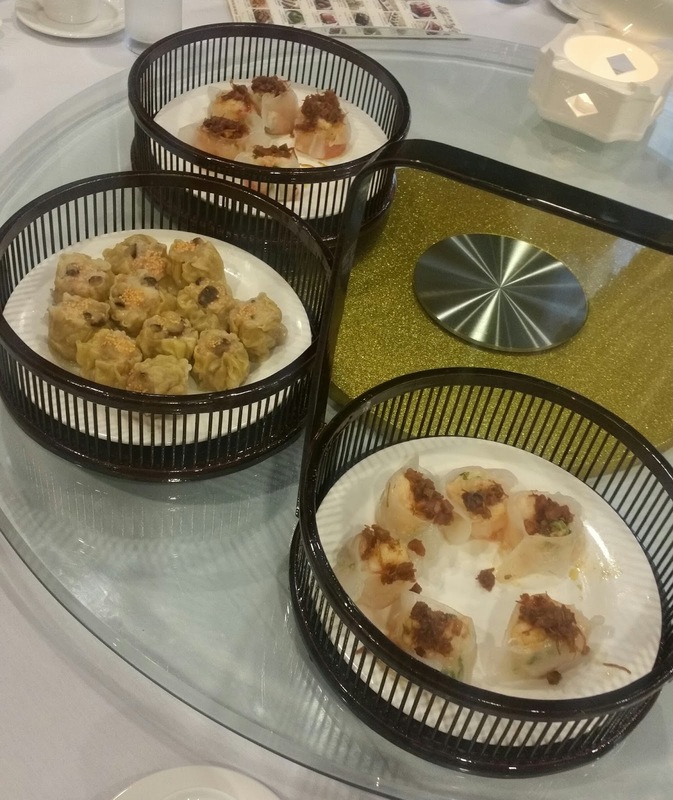 Start with the steamed selections before moving to the heavier fried selections. Always serve the person(s) of honor and eldest first. When the bill comes, fight over it or lose face. I'm definitely looking forward to a future road trip with friends to enjoy the offerings of Peony Restaurant again soon.